The Tranquil Otter Self-cateringBeautiful private nature reserve around a stream fed lake teeming with wildlife; The Tranquil Otter is an ideal place in which to take a relaxing break, for families and couples. We have eight lodges, each with breath-taking views across the lake. 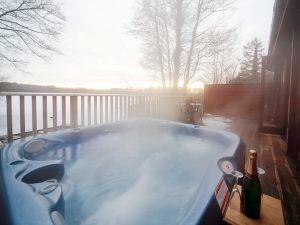 Chiffchaff lodge private lakeside hot tub.